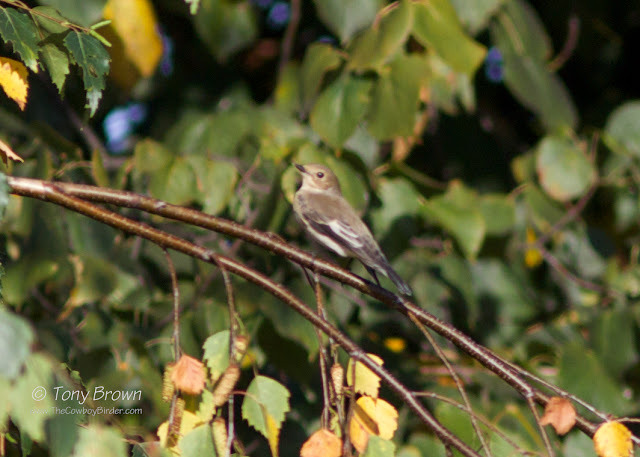 The Cowboy Birder: Pied Fly - at Speed! A real smash and grab session on the patch this morning (too much other stuff to do over the weekend) resulted in adding Pied Flycatcher to the year list (95). You can forget speed dating this was speed birding! I was out by 6am and home by 10am but in the intervening four hours I'd had a good, if brief session. Along with the Pied Fly, I'd also seen 3 Spotted Flycatcher, 2 Common Redstart and singles of both Whinchat and Wheatear. There were also a couple of Lesser Whitethroat and Garden Warbler along with the usual Whitethroats, Blackcaps and Phylo's - by no means a classic autumn fall but certainly enough interest to make those precious few hours absolutely whizz by. Not the best photograph I've ever taken, but a patch Pied Fly is always a welcome sight - even if the bugger wouldn't keep still or was that me! Wishing for more of the same in the next few weeks Steve...but just need that icing on the cake bird!